/ A Falcon 9 rocket launches from Vandenberg Air Force Base. Welcome to Edition 1.44 of the Rocket Report! There remains no let-up in the world of lift, with lots of activity in the realm of smallsat launchers as well as some interesting speculation about the future of Aerojet's rocket engine business. Oh, and we think we know why SpaceX hasn't had too much to say yet about a Falcon Heavy Moon mission. Relativity announces first launch contract. The California-based rocket company Relativity announced its first customer on Friday, the global satellite operator Telesat. The contract for flights on the Terran 1 rocket includes "multiple" launches, but in an interview with Ars Relativity CEO Tim Ellis said he could not provide additional details. Although this is the first contract the company has chosen to announce, he said, Relativity has signed other binding deals earlier. Good company to be in ... Ellis said Telesat has been in discussions with Relativity for a while, so the satellite operator has had good access to Relativity's launch technology. After this due diligence, Telesat chose Relativity in addition to previous deals with SpaceX, Arianespace, and Blue Origin. Effectively, Telesat has decided that Relativity's Terran 1 booster, with a capacity of 1.25 tons to low Earth orbit, has the right stuff to help launch a major low Earth orbit satellite constellation that will provide global broadband connectivity. Three companies chosen for DARPA challenge. Vector, Vox Space (a subsidiary of Virgin Orbit), and a stealth-mode company have qualified to participate in the DARPA Launch Challenge, the agency announced at the 35th Space Symposium. Industry sources believe that the stealth company is most likely Astra Space, a company developing a small launch vehicle, Space News reports. Rocket Lab offering satellite service. The company that launches from New Zealand says it will offer an in-house satellite platform that can be launched from its Electron vehicle. According to the New Zealand Herald, the company believes this satellite "bus" could be even more disruptive to the aerospace industry than its Electron booster. Virgin Orbit officially adds Guam launch site. Officials at US Pacific Air Forces have issued a letter of support for Andersen Air Force Base to host launches and other exercises with LauncherOne and its dedicated carrier aircraft, the company said Wednesday. A launch from the island could take place within as little as 12 months. Two sounding rockets launch quite a show. Late Friday night, two sounding rockets launched from a small spaceport in northern Norway. The two skinny rockets soared to an altitude of 320km, and along the way each released a visible gas intended to disperse through and illuminate conditions inside the aurora borealis, Ars reports. Old launch tech ... 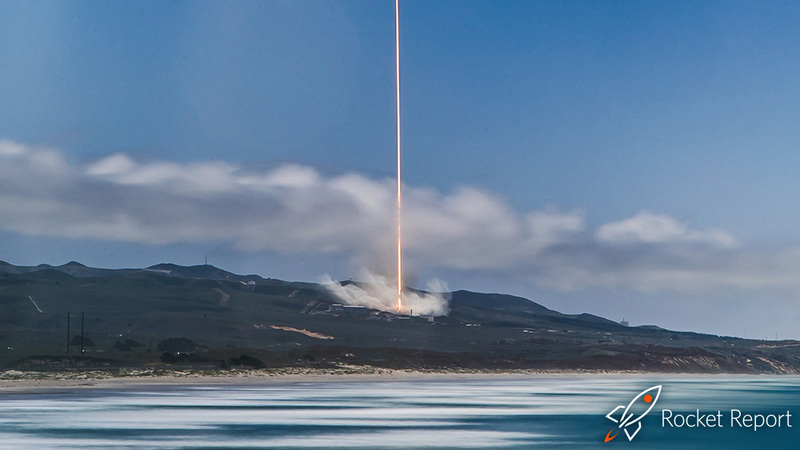 This NASA-funded AZURE mission, which stands for Auroral Zone Upwelling Rocket Experiment, is one of a series of sounding rocket missions launching over the next two years to study this and similar phenomena. Friday. night's mission involved two Black Brant XI-A rockets, a three-stage sounding booster with a long heritage dating back to Canadian military research in the 1950s. The Black Brant rockets launched within two minutes of one another from the picturesque Andøya Space Center in Norway. SpaceX drops protest of NASA contract. The rocket company has withdrawn its protest of a contract the space agency awarded to United Launch Alliance for the Lucy mission, which is slated for launch in October 2021, Space News reports. SpaceX had argued it could perform the same mission for a “dramatically lower” price than the $148.3 million price NASA said it would pay United Launch Alliance. A relief to mission planners ... SpaceX did not say why it dropped the protest. But according to the publication, the decision alleviates the concerns mission planners had about additional costs had GAO upheld the protest and forced NASA to re-compete the contract. The time and cost of additional delays would likely have negated any cost savings from going to a less-expensive Falcon 9 rocket. Falcon 9, Crew Dragon appear to be a winning combo. Although it was generally regarded as a more risky play than blue-blooded Boeing in NASA's commercial crew competition back in 2014, SpaceX now appears poised to win the honor of becoming the first private company to launch humans into orbit. A crewed Dragon flight could come as early as this fall, while Boeing will not fly its first uncrewed mission until at least August, and NASA has acknowledged that this date may well slip again, Ars reports. Eye-opening seat costs ... The article also attempts to break down the per-site price that NASA will actually pay SpaceX and Boeing. NASA has only released a generic number, $58 million. According to the analysis, NASA will pay Boeing about $71.6 million per Starliner seat and SpaceX $44.4 million per Dragon seat. One lesson from commercial crew appears to be that healthy competition among providers is good, and commercial contracts can lead to lower prices. GEM 63 motor completes second test fire. Northrop Grumman’s new 63-inch Graphite Epoxy Motor solid rocket booster completed another step in its progression toward flight, a static fire test under "hot" conditions. The booster's temperature was increased to 90 degrees Fahrenheit for the test, SpaceFlight Insider reports. The solid rocket motor was previously tested under "cold" conditions in September. SpaceX sets launch date for first Starlink mission. SpaceX has announced a launch target of May, 2019, for the launch of its first batch of operational Starlink satellites, Teslarati reports. The publication says R&D will continue as engineers work to implement the true final design of the satellites, but a significant amount of the team’s work will now be centered on producing as many Starlink satellites as possible, as quickly as possible. Short seller raises concerns about Aerojet. The activist hedge fund Spruce Point Capital Management, which last year raised questions about satellite maker Maxar Technologies before its stock price tumbled, said it also believes rocket engine maker Aerojet is overvalued. "We believe the loss to Blue Origin was the death blow to Aerojet by losing ULA, its only customer in space launch," a new report by the investment firm states. Contract losses ... According to the fund's founder, Ben Axler, Aerojet's stock has risen based on earnings the last two years, but at the same time it has seen critical losses, with ULA dropping the AJ-60 motor, the looming end of the Delta rocket's use of RS-68 engines, and the aforementioned AR1 loss to Blue Origin's BE-4 engine. Axler also noted questions about the future of the Space Launch System rocket, and Aerojet's contract to provide RS-25 engines. The report raises issues about financial reporting and management, as short sellers typically do in order to profit from stock price declines. "The investors are fundamentally missing the change that’s happening at the company," Axler argues. Omega rocket likely needs Air Force to survive. As the Air Force nears the issuance of a solicitation for military launches for 2022 to 2026, Northrop Grumman told Space News it is hopeful about receiving a contract. "If we don’t win (an award), we’re evaluating what we would do with Omega," Former NASA astronaut Kent Rominger, who is Northrop Grumman’s vice president for strategic programs, told the publication. "Depending on the outlook and other factors, we could easily decide to press on with Omega. But there is a chance, too, depending on what we see, that we would decide at the time to not continue, or maybe put it on the shelf." Congress the key ... In the quest to institute changes needed to accelerate NASA's plans, Bridenstine will have to fight on multiple fronts. Large aerospace firms, with their influential lobbies, will want to protect existing contracts. NASA field centers will fiercely protect their turf. The White House Office of Management and Budget will be reticent to sign on to new, long-term costly programs. And there is simply the inertia of a large bureaucracy like NASA and managers who will resist change to their programs. However, Bridenstine's biggest hurdle will be Congress. Sun 28° Aries 37' 40"
Moon 21° Libra 52' 22"
Mercury 02° Aries 08' 30"
Mars 12° Gemini 19' 29"